By Mike Smith: Unbeaten cruiserweight champion Oleksandr Usyk (16-0, 12 KOs) is quite clear when asked if he wants to face former two division world champion Andre Ward (32-0, 16 KOs). When asked by Fighthype if he’d be willing to fight Ward, Usyk immediately said, “Yes.” The look on Usyk’s face suggests that he would like nothing more than to face the 34-year-old ‘SOG’ Ward if he decides to come out of retirement. However, Ward appears to be less eager to fight Usyk, and it remains to be seen whether he’s got enough motivation at this stage of his life to return to the ring for what would likely be the toughest fight of his career. Ward is saying that it’s going to take a lot for him to return to the ring against the 31-year-old Usyk. Just how much of a purse it would require to tempt the retired Ward is unknown at this time. “I’m chilling. It would take a lot to make that fight happen,” Ward said to Fighthype when asked if he’d be interested in coming out of retirement to face Usyk. There’s money to be made for Ward if he comes out of retirement to face Usyk. The question how eager Ward would be to take the fight. It might not end well for Ward. Usyk is arguably a level above Sergey Kovalev, and he’s clearly better than the fighters that Ward has been beating before that. Ward’s previous six fights before Kovalev were against these guys: Alexander Brand, Sullivan Barrera, Paul Smith, Edwin Rodriguez, Chad Dawson and Carl Froch. Usyk would likely easily beat all those fighters. Ward hasn’t fought since last year when he defeated Sergey ‘Krusher’ Kovalev for the second time in their fight in June 2017. Ward has now been out of action for a year and a half. That’s a long time, but not to the extent that he couldn’t come back and still perform at a high level. The question is whether Ward would be willing to risk his unbeaten record against Usyk when he comes back. Ward obviously saw something in Sergey Kovalev’s style that made him want to move up from super featherweight to light heavyweight to face him the first of two times in 2016. Ward beat Kovalev by a controversial 12 round unanimous decision in November 2016 after being dropped hard on the canvas in the 2nd round. The remainder of the fight involved Kovalev landing hard shots from the outside, and Ward mauling him in close with grappling. In the rematch, Ward beat Kovalev by a controversial 8th round stoppage after landing several blows that a lot of boxing fans felt were low. The controversy surrounding Ward’s two wins over Kovalev took away a lot of the credit that he otherwise would have gotten in beating him. Moreover, there were other fighters at light heavyweight that Ward didn’t fight for whatever reason. The boxing public wanted Ward to face Artur Beterbiev, Adonis Stevenson, Dmitry Bivol and Badou Jack. Those would have been good fights for Ward, but he chose to retire without fighting them. Ward says that Tony Bellew (30-3-1, 20 KOs) struggled with his weight in his fight against Usyk last month on November 10. 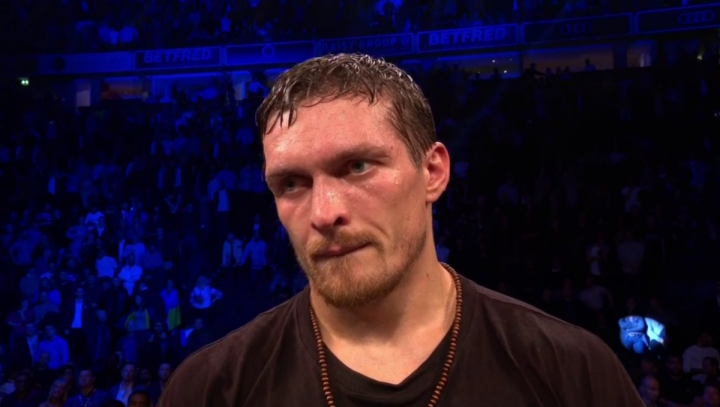 Usyk stopped Bellew in the 8th round after dropping him hard with a big left to the head. Bellew’s two previous fights were both at heavyweight against David Haye. Bellew could have likely gotten Usyk to agree to a catchweight fight at heavyweight, but he wanted to fight him for all four of his cruiserweight titles. In hindsight, it was a bad decision on Bellew’s part to move back down to cruiserweight. “He hit a wall. When you move up like that, you can’t move back down,” Ward said about former WBC cruiserweight champion Tony Bellew. It probably wouldn’t have mattered whether Bellew had stayed at cruiserweight and never moved up to heavyweight for his two fights with Haye. Bellew was always going to have problems against a talented fighter like Usyk.